To any retailer, a strong supply chain is necessary, and it was no different for this household appliance retail chain in Australia. The company works with a number of third-party contractors, including supply agents, payment gateway providers, and point of sale (PoS) vendors. These third parties require frequent access to the internal network to fulfill their contractual duties. The biggest challenge that the IT division of the retail chain faced was provisioning the required privileged access to the vendors based on their needs. Granting remote access included exposing the credentials of privileged accounts, which were shared with the contractors by email. They found it difficult to track ‘who’ had access to ‘which’ passwords and ‘what’ they were doing. 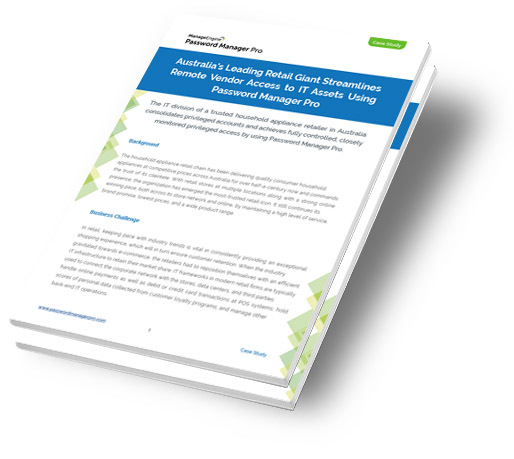 The retail chain deployed Password Manager Pro to consolidate privileged accounts and thereby achieved fully controlled, closely monitored privileged access.